To ensure the smooth operation of the conference and avoid long delays at the on-site registration desk, participants are strongly advised to register for the conference in advance. *The fees will automatically change on August 8, 2013 (Japan standard time). *Member rates apply to members of the following societies: SICE, SICE supporting members, IEEE, ICROS, ISA, CIS, CAA, CACS and JEMIMA. The maximum number of submissions allowed by each applicant depends on the type of registration. 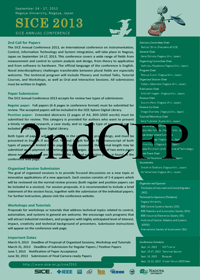 For full registration, regardless of time (advanced or not), the limit of submissions is two papers. For student registration, the limit is one paper. *One ticket is INCLUDED in the FULL registration fee. *Banquet ticket is NOT INCLUDED in the STUDENT registration fee. *One copy is INCLUDED in the registration fee. *In case of cancellation, your registration fee will be refunded after deducting the cancellation fees as shown below. *Please note all refunds will be made after the conference. *Please revise and/or cancel your registration by logging-in to your "My Page". Cancellations made before the July 11 Final Paper Submission deadline will not be subject to a cancellation fee. Cancellations cannot be accepted after the July 11 Final Paper submission deadline. Refunds will not be provided after this date. Cancellations made before the September 6 Advance Registration deadline will not be subject to a cancellation fee. Cancellations cannot be accepted after the September 6 Advance Registration deadline. Please send us your inquiries by logging-in to your "My Page" and clicking on the "Inquiry" button.